Lalgarh Palace is a palace in Bikaner in the state of Rajasthan. Lalgarh Palace is truly an architectural beauty of Rajasthan. 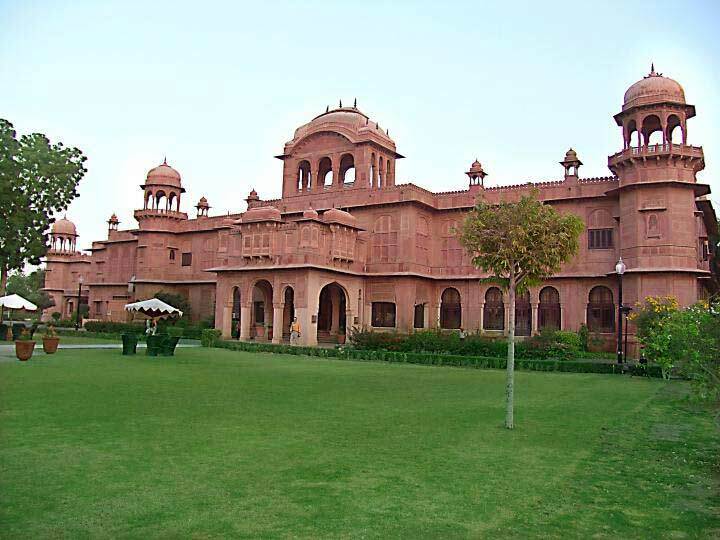 This impressive red- sand stone palace was built by Maharaja Ganga Singhji in 1902 A. D. He got this palace constructed in the memory of his father, Maharaja Lal Singh. It was designed by Sir Swinton Jacob. The architecture of this place showcases an amazing blend of Mughal, Rajput, and European architecture. The intricately carving on red stone reflects the skills of great local craftsmen. Lalgarh palace has a library ‘Anup Sanskrit Library‘. It has the largest collection of original Sanskrit manuscripts. A portion of the palace has now become heritage hotel whereas the other part of the palace serves as the dwelling of the royal family. The palace encompasses a rich collection of impressive paintings and hunting trophies of the old Maharajas.The flowering terraced gardens of this palace are beautifully decorated with Bougainvillea plants. You can see the peacocks walking around this huge palace make a great visual treat. This architectural masterwork also incorporates latticework and filigree work. This beautiful palace is like a fresh splash in the dryness of the Thar Desert. The three-storied complex is coated in red sandstone quarried from the Thar Desert. The complex contains the features considered essential for a late 19th-century palace: drawing rooms, smoking rooms, guest suites, several grand halls, lounges, cupolas, pavilions, including a dining room which could seat 400 guests. The complex features magnificent pillars, elaborate fireplaces, Italian colonnades and intricate latticework and filigree work. The Karni Niwas wing has the darbar hall and an art deco indoor swimming pool. The palace has now been converted into a heritage hotel. The royal family of Bikaner still lives in the building and has one part for themselves. The palace has a beautiful portico and features many over hanging balconies and lattice work. The intricate framework work and network are the main attractions of the structure. The palace also features terraced lawns complete with bougainvillea and wandering peacocks. The building also features splendid pillars, elaborate firesides, Italian arcades and motifs of lotus in full blossom which adds up to the magic of this place. The walls of the palace take you back in the past with the vintage designs, shooting crowns and old portrayals being displayed on them. By Road: Lalgarh Palace is located in Bikaner city near central bus stand on Sriganganagar Rd. One can easily reach here by RSRTC bus, local bus or local taxi or walk. By Rail: Lalgarh Palace is well connected through nearest Bikaner Railway station (3 km) to major cities railway stations like Delhi, Agra, Mumbai, Chennai, Bikaner, Pali, Jaipur, Ahmedabad. By Air: Lalgarh Palace can be reach through nearest Jodhpur Airport (250 Km) which is well connected with regular domestic flights to Delhi, Mumbai.